Papeeria: Vote for Papeeria on TeX Stack Exchange! Vote for Papeeria on TeX Stack Exchange! we need your help. Yes, again. 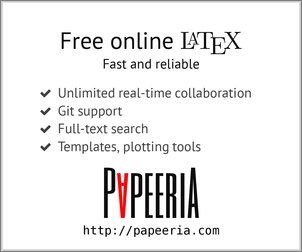 TeX Stack Exchange site, one of the best Q&A resources on LaTeX, is running Community Promotion Ads campaign. They will be showing small banners on their pages for free during the whole 2016 provided that banner gets enough votes from the community members. Our banner participates in the competition and we need your vote! Who can vote: those who have more than 15 reputation points on TeX SE. If you have them then just vote. If you don't have reputation on TeX Stack Exchange, but have good reputation on other sites from Stack Exchange network, e.g. on Stack Overflow, then you can associate your account on TeX SE with account on Stack Overflow and most likely you'll get enough reputation points to vote.